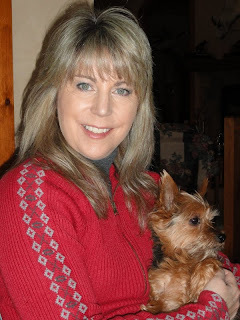 That’s me, Sherri with Scrappy from Yorkie Tails. I am fortunate to have a job in the ski industry that allows me to work mostly from home with a few ski trips mixed in now and then. I have a loving husband, one daughter married to a great guy, a son in college and one son in high school. 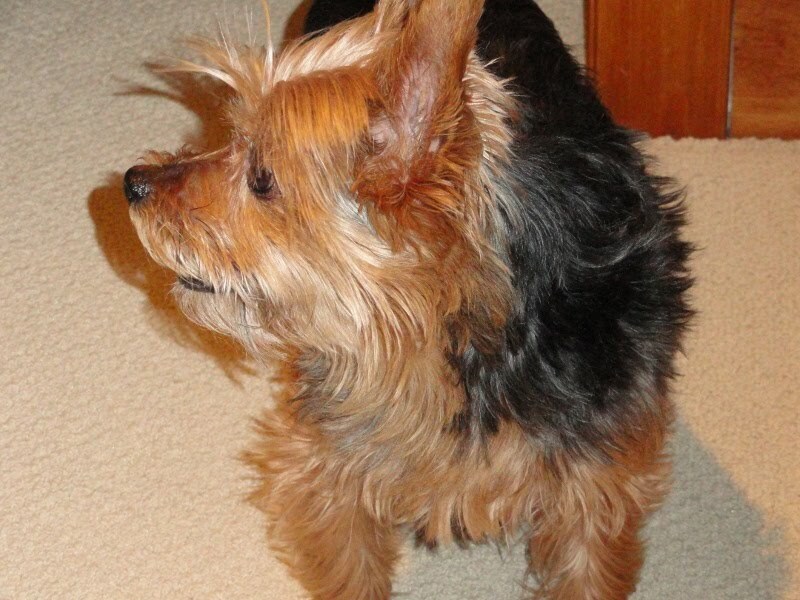 Scrappy is a Yorkshire Terrier, a female, but most definitely a Tom-boy. She will be 10 years old this summer, but she acts like a pup! We are at the lake having a relaxing day off, a rarity this time of year. Maxwell House International Suisse Mocha Cafe’ frothed with skim milk and a touch of hazelnut in the Froth au Lait. Any treats for you or Scrappy on this occasion? Just the coffee this morning. Sadly, no treats for Scrappy today. She can only have bites of bread for treats, as she has pancreatitis brought on by a bad mushroom. Curious? Read her Toxic Hike post. How were you and Scrappy united? 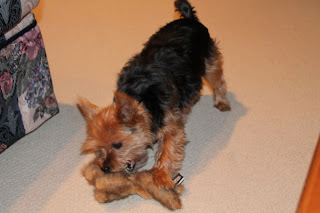 So, our daughter started the search and found a cute little female yorkie on the internet. She paid half the price with her hard earned babysitting money. The one she wanted was a little female born in Ireland who made her way to a farm in Minnesota. The pup was then carried on board a flight to us in faraway Montana. When she arrived, she fit in the palm of our hand. Within days of arriving, she became very ill with kennel cough. 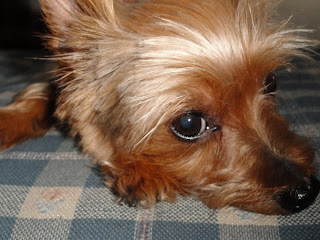 It was a rough go at first, but she was--and still is--a “fighter.” She slept in her crate on our daughter’s bed every night and was supposed to be our daughter’s dog, but when school started up in August, Scrappy bonded to me. Bonded might even be an understatement. My husband often says she is drawn to my magnetic forces. Our youngest was crazy for the cartoon Scooby Doo and that name just seemed to fit. Still does, actually. Scrappy Doo, Scrapster, Doozer, Missy, Lil Monkey, and Houdini...because a few times she has mysteriously escaped from her Pet Carrier. She is crazy for birds, squirrels, and especially chipmunks. Her favorite toy is her Bunny...or anything that squeaks. Favorite games - Tug of War and Fetch. She lives to hike, camp and especially fish. She will stand in the lake or river up to her belly in the water and just paw at the fish as they swim by. She is as tough as they come. Don’t let her size fool you. Who is Scrappy's best pet-pal? She still looks downstairs and out in the kennel at the lake for her sister Shadow (the Lab), who we lost over a year ago. Now, her best friend is our daughter’s Lab/Border Collie Kootenai, but sadly they recently moved far away. She also has a Twitter-furiend - Jakey - a virtual admirer. What is Scrappy's best quality? She has a heart of gold and a most unique personality. If Scrappy could change one thing about you, what would it be? She would want me to work less and spend all day just playing with her. If Hollywood made a movie in which Scrappy could talk, who should do her voice? Since she is from Ireland, I would say she would have Roma Downey’s accent, but Kathyrn Hepburn’s voice.... She is compassionate, very intelligent, but at the same time feisty and headstrong. If Scrappy could answer only one question in English, what would you ask? What ever were you thinking when you swallowed that toxic mushroom? Visit the Yorkie Tails blog. Sorry! I'll try this again! They need spell check on these things! As I was saying, great interview! It was fun to learn more about you and Scrappy. She is such a sweetie!! Wonderful interview! I love reading about Scrappy and her person. And Scrappy's Twitter furfriend sounds intriguing! It was great to learn more about Scrappy! I had no idea Scrappy was 10 ten years old! She looks great! Oh what a great interview! I already knew all that stuff about you, Scrappy, but since you are my sister, I read it anyways! But seriously...I really liked it. Especially that picture of your Sherri! I happily eat all those treats you can't! Miss you from Kansas! What a cute little dog. I didn't know about toxic mushrooms. I thought most animals had a good instinct about what is growing outside that is bad for them. Maybe not so much, I guess. Terrific interview! 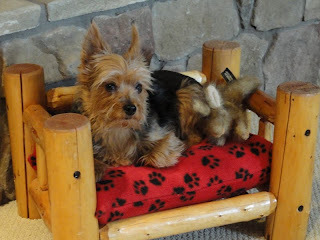 We hope that Scrappy's feeling much better soon! Perfect name for her! I had no idea has been so sick in her little life. Poor little girl. This was a great interview and I'm so glad you mentioned your toxic mushrooms post - that's good information to know.